Udmurt (удмурт кыл, udmurt kyl) is a Uralic language, part of the Permic subgroup, spoken by the Udmurt natives of the Russian constituent republic of Udmurtia, where it is co-official with Russian. It is written using a Cyrillic alphabet, including five characters not used in the Russian alphabet: Ӝ/ӝ, Ӟ/ӟ, Ӥ/ӥ, Ӧ/ӧ, and Ӵ/ӵ. Together with Komi and Komi-Permyak languages, it constitutes the Permic grouping. Among outsiders, it has traditionally been referred to by its Russian exonym, Votyak. Udmurt has borrowed vocabulary from the neighboring languages Tatar and Russian. Ethnologue estimates 550,000 native speakers (77%) in an ethnic population of 750,000 in the former USSR (1989 census). A continuum of intermediate dialects between Northern and Southern Udmurt is found, and literary Udmurt includes features from both areas. Besermyan is more sharply distinguished. The differences between the dialects are regardless not major, and mainly involve differences in vocabulary, largely attributable to the stronger influence of Tatar in the southern end of the Udmurt-speaking area. A few differences in morphology and phonology still exist as well, e.g. Southern Udmurt has an accusative ending -ыз /-ɨz/, contrasting with northern -ты /-tɨ/. Southwestern Udmurt distinguishes an eight vowel phoneme /ʉ/. Besermyan has /e/ in place of standard Udmurt /ə/ (thus distinguishing only six vowel phonemes), and /ɵ/ in place of standard Udmurt /ɨ/. 1 Only used in Russian loanwords and names. 2 Silent, but required to distinguish palatalized consonants (/dʲ tʲ zʲ sʲ lʲ n/) from unpalatalized consonants followed by /j/ if followed by a vowel; for example, /zʲo/ and /zjo/ are written -зё- and -зъё-, respectively. The consonants /f x t͡s/ are restricted to loanwords, and are traditionally replaced by /p k t͡ɕ/ respectively. Udmurt is an agglutinating language. It uses affixes to express possession, to specify mode, time, and so on. Depending on the style, about 10 to 30 percent of the Udmurt lexicon consists of loanwords. Many loanwords are from the Tatar language, which has also strongly influenced Udmurt phonology and syntax. 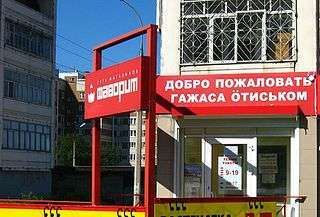 A bilingual sign proclaiming "welcome" in Russian "добро пожаловать" /dɐbˈro pɐˈʐaləvətʲ/ (upper) and Udmurt "гажаса ӧтиськом" /gaʒasa ətʲiɕkom/ (lower). This picture was taken in Izhevsk, the capital of Udmurtia. Eurovision runners-up Buranovskiye Babushki, a pop group composed of Udmurt grandmothers, sing mostly in Udmurt. The romantic comedy film Berry-Strawberry, a joint Polish-Udmurt production, is in the Udmurt language. 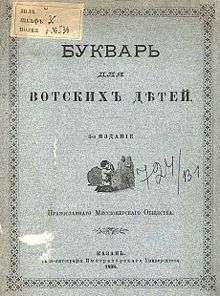 The Bible was first completely translated into Udmurt in 2013. Kel'makov, Valentin; Sara Hännikäinen (2008). Udmurtin kielioppia ja harjoituksia (in Finnish) (2nd ed.). Helsinki: Suomalais-Ugrilainen Seura. ISBN 978-952-5150-34-6. Moreau, Jean-Luc (2009). Parlons Oudmourte. Paris: L'Harmattan. ISBN 2-296-07951-2. ↑ Hammarström, Harald; Forkel, Robert; Haspelmath, Martin; Bank, Sebastian, eds. (2016). "Udmurt". Glottolog 2.7. Jena: Max Planck Institute for the Science of Human History. ↑ Ethnologue code=UDM Archived October 9, 2008, at the Wayback Machine. ↑ "BGN/PCGN romanization of udmurt". Retrieved 24 March 2012. ↑ Omelyanchuk, Olena (7 March 2012). "Buranovskiye Babushki to represent Russia in Baku". European Broadcasting Union. Retrieved 12 April 2015. ↑ "First Bible in Udmurt – arrives this week!". United Bible Societies. Retrieved 12 April 2015. Wikivoyage has a travel guide for Udmurt phrasebook.